...And Baby Makes Three! 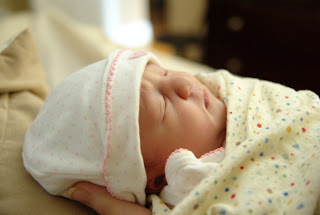 : Our Nora Caitlyn is here! 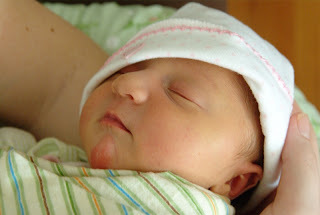 Nora Caitlyn was born on October 2nd, 2008 at 4:06 am! After 12 hours of very hard and challenging active labor and 51 minutes of pushing, Nora was born into my arms at home. Labor began at 12:30 am (Tuesday night) with a few contractions that felt more regular and a bit stronger than normal. Luckily I was able to sleep most of the night, waking at 4:30 am. I woke Chris and gave him a heads up that this may be something. I still wasn't sure. I fell back asleep and we got up at 7 am b/c we had to take our cat Leeloo to the vet. I wasn't sure I was really in labor or if it was another false alarm, and I really wanted to see Leeloo off (we had to drop her off for x-rays). So, somehow, I was able to go along for the ride to the vet at 8 am. I had only a few contractions on the way there and while there, and thought maybe it was indeed a false alarm! They were still coming at about 9-10 minutes apart. Once home, at around 11, the contractions started to intensify. By noon, I was timing them more diligently, and had to completely concentrate to get through them. I was sure at this point it was labor, but knew it was still early. The contractions were coming less than 5 minutes apart. Between 1 and 2 pm, we called the midwives answering service and the midwife on call, Pam, called us back shortly after. We told her what was going on and gave her a heads up that things were happening. It didn't take long for us to call her back and tell her she should probably start making her way up. At around 3, Chris had to go pick up Leeloo. I was terrified to be left alone, but I really needed him to go pick her up. I knew it was still early and I was able to breathe and moan through the contractions enough while lying over my birth ball so I told him to go. I knew Pam would be there soon and that he would be back soon as well. Laboring alone wasn't as bad as I thought it would be. I was on my own for a little over an hour, but did well. After that, things get a little fuzzy. Chris came back, Pam and Becca (her assistant and a student midwife) arrived and checked me. I was around 2 cm. I had a long way to go. The contractions were so incredibly intense, and baby Nora was OP (posterior) so my back literally felt like it was being hit with a sledge hammer with every one. It took a few hours for me to get to 5 cm, and I was changing positions as often as I could, from lying over my birth ball while on the bed, and sitting on the toilet. Chris was my rock through the whole labor, encouraging me through every single contraction, holding my hands, telling me how beautiful and strong I was. It was so hard. It was the most excruciatingly painful experience, really pushing me to the limits of my mental and physical strength. I finally felt a little bit like pushing when the contractions were hitting at their strongest, so Pam and Becca said that if my body started pushing to go ahead and go with it. It didn't feel good. It felt so incredibly painful. After awhile of going like this, Pam decided she wanted to check me to make sure I was fully dilated and not pushing for nothing. I didn't want to be checked, I couldn't imagine how painful it was going to feel! But she put it to me this way - everything was incredibly painful right now. I didn't have a choice. I couldn't keep pushing against a cervix that wasn't open. So, she checked me and, indeed, I was only about 7-8 cm. But I was complete! 10 cm! Also, during that time, Nora had rotated herself from OP to LOA all by herself. They said I could finally push and bring my little girl into the world! They spun me around on the bed so my bottom was closer to the edge, and had me lay on my back propped up on pillows. Chris stayed behind me and I had has hands. Becca and Pam pushed my legs up towards my chest so I had some leverage to work against. With every contraction I just had to give it my all and push as hard as I could. Every push was bringing her further and further down. I wanted her out so bad. I could not imagine how much longer this could go on, I was completely exhausted. After 51 minutes of pushing, I felt her head sort of pop through, and Becca and Pam said, "Reach down and grab your baby!" I looked up and out she came, I caught her in my hands and pulled her up to my chest! She was absolutely gorgeous! Big blue eyes looking all around, barely a sound coming from her except for a few little whimper-y mewing noises! Chris and I were just completely overwhelemed with emotions and love for our little girl! She was so perfect and so wonderful - and after all that work, to see her face finally, and know she was alright was the most exhilarating feeling in the world. The first few days have been such an experience for us. Nora is now 2 days old and is nursing pretty well. My body feels like it has been put through hell and back, and I had a few tears that needed stitches so I'm pretty sore. But Chris and I are so in love with our little girl, it makes the lack of sleep and juggling her back and forth completely worth it. We will update again soon with more! Great pictures! If you need anything, let us know! Pretty Baby Girl.....we are so happy for you all....can't wait to meet her.....Good Job Mommy & Daddy !!! This made me tear me up. What a great story. She is beautiful! Congratlations! She's adorable. You are my total hero! I mean this in all seriousness. I'm in awe of how you were able to handle everything and roll with the punches (literally and figuratively). I am blown away by your will, strength, and courage--not only during labor, but throughout the whole pregnancy experience! Huge pats on the back to Chris too because I'm sure it was incredibly hard for him to go through the experience of seeing you in so much pain and not really being able to do more than "be there" but I'm sure it was exactly what you needed from him. My mom says she's proud of you too. :) Congratulations again!